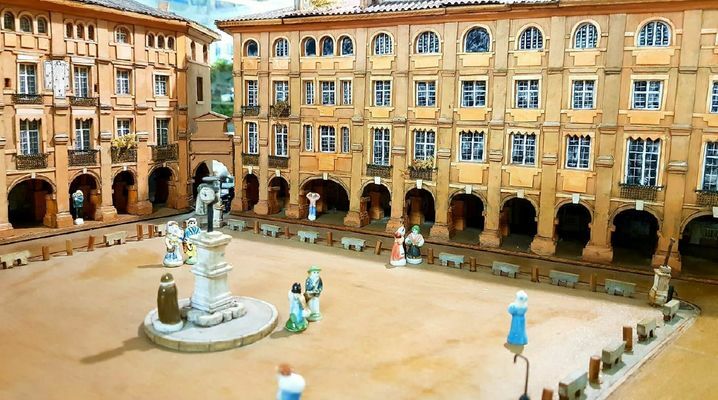 Revisit the history of Montauban through ancient toys. This is what proposes, from April 6 to 27, the Toy Museum which invests the House of the Crier with an original exhibition intended to delight young and old. Over fifteen dioramas, visitors will indeed discover or rediscover in a fun way the architectural jewels and celebrities of the city, but also some highlights of its economic and social life through the centuries. Lead figurines of cross knights evoke Alphonse Jourdain, who founded Montauban in 1144 to protect Toulouse against royal incursions. The great artists of Montalban are also in the spotlight, with pallets and boxes of old paint in tribute to Jean-Dominique Ingres and a Eiffel Tower in Meccano, a nod to Antoine Bourdelle who sculpted in 1900 the bust of Eiffel installed at the foot of the north pillar of his tower. There are also reproductions of the locomotive Poult, symbol of the famous biscuit factory founded in 1883 by Emile Poult and the post-war Micheline circulating on the Montauban-Lexos railway line, but also bows and arrows evoking the Indians Osages who found refuge in Montauban, or circus tents and animal figurines reminiscent of the time when the circus Pinder took its summer quarters near Montauban ... A great fun and informative opportunity to go back in time! About the Toy Museum The Montauban Toy Museum was born from the meeting between Gérard Misrai, a great collector of antique toys, and Michèle Gualino, founder of the nursery "La maison d'Irène". In an area of 600 m² where thousands of rooms are exhibited, volunteers animate the visits by telling stories and anecdotes. The opening of the exhibition will take place on Saturday, April 6 at the sound of a barbarian organ.